Join us in 2019, "Our 49th Season", for the Hunting or Fishing Trip of a Lifetime!! Likely your Best Chance at a Trophy Northern Pike! 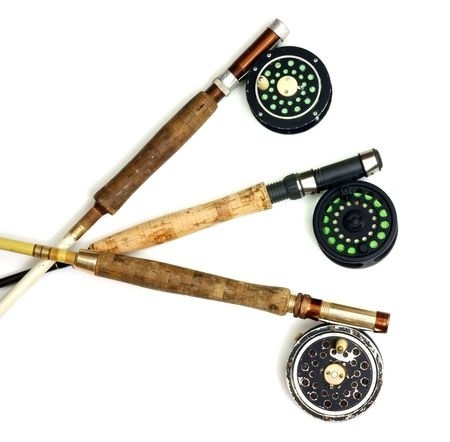 Some Saskatchewan fishing equipment, needed on a fishing trip to Lawrence Bay Lodge, should include a medium heavy 6-7 foot casting or spinning rod equipped with 8-20 lb. line. Rain Gear is also a good idea. Temperatures average 66 to 78 degrees in June, July and August, with September temperatures in the mid 50’s. Reindeer Lake fishing tackle and License are available at the lodge. Some Canada fishing tackle to consider bringing up with you is the new Slugo type bait, which is a large single hook plastic lure. Floating lures are also very productive, like the Rapala’s and Heddon’s and also try crankbaits like Rapala’s Rattle traps and Storm’s Hot n’ Tots. Bucktail and Mepp’s minnow lures work very well also. 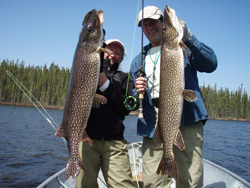 Last, but certainly not least, for important Canada fishing equipment, is the old Standby spoons (such as Daredevil and Len Thompsons) which work very well for Big Northern Pike and Lake Trout. Also, if you are a fly fisherman, make sure that you bring your fly rod to Saskatchewan as well. Fly rods have been working great for the big Northern Pike, which love the new presentation of the flies. Is this a corporate trip?